Cloudy afternoon at City Beach and Fremantle cranes…. Out and about at Fremantle…old historic cranes next to the maritime museum, and a cloudy afternoon at City Beach…. looks like rain later. With a bit of spare time this afternoon I decided to go train spotting…..at the W.A. 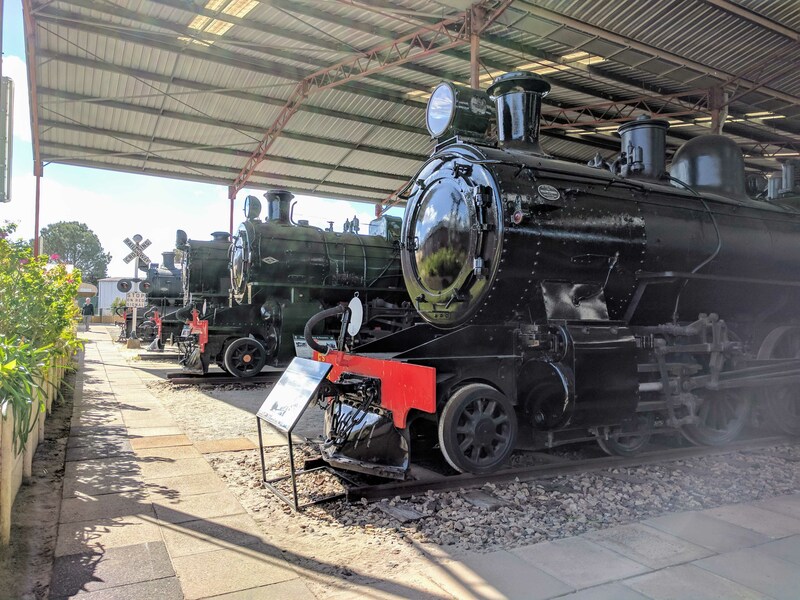 Rail Transport Museum in Bassendean. 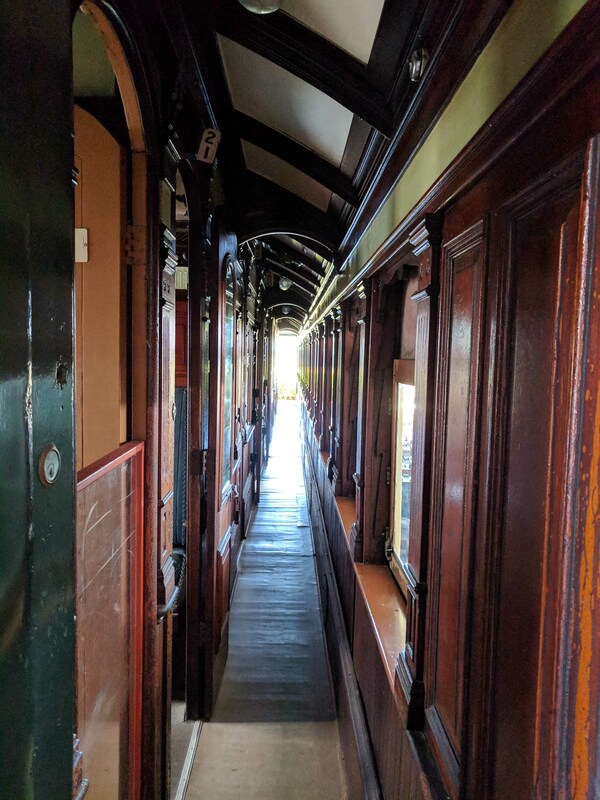 Here are a couple of engines sketches and some photos inside the carriages …. 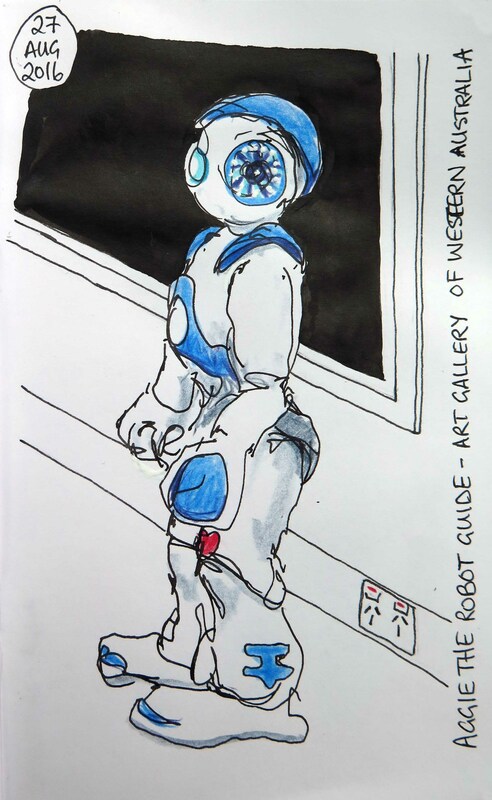 Yoga at the Art Gallery of Western Australia and Aggie the robot! 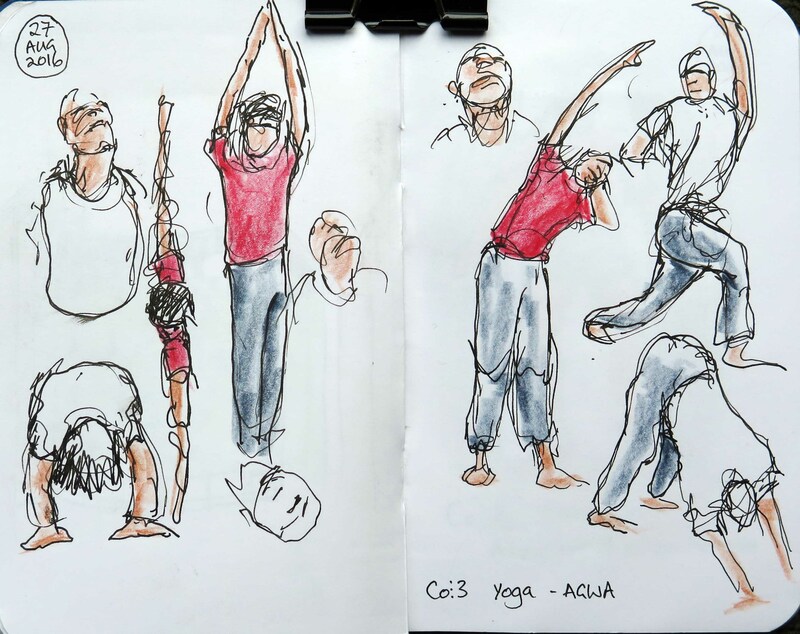 The Urban Sketchers Perth planned meet up at Elizabeth Quay was moved to inside the Art Gallery of Western Australia this morning because it was very wet, windy and cold (Elizabeth Quay is very exposed). One thing we weren’t expecting was to find a contemporary dance company (Co3) performing warm up yoga in the main foyer prior to an actual dance performance. 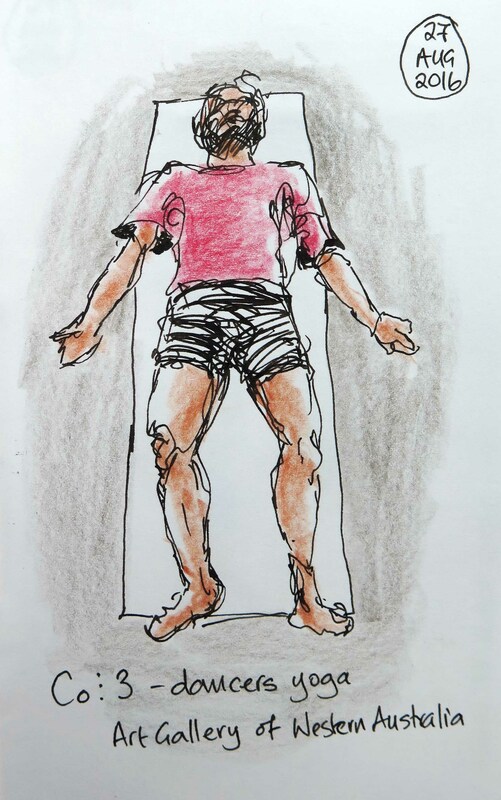 They were of course very fit, supple and graceful, my sketches don’t show how lithe they actually were….I thought sketching them at yoga would be easy because they would move slowly…but no…they moved through all the moves very quickly, flowing from one to another until savasana at the end. A visit to Perth Museum while the rain fell with the Perth Sketchers, the museum is closing soon for a 4 year refurbishment, expected to re-open in 2020. 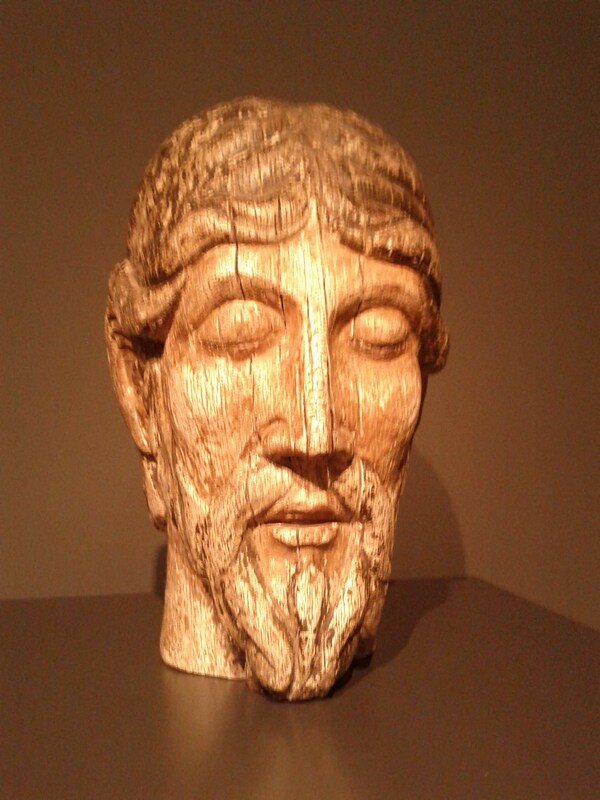 Last and only exhibit on at the moment is the “A history of the world in 100 objects” – items lent by the British Museum. The oldest is a hand axe dated at over a million years old created by one of the first humans, found at a site in Tanzania, quite astonishing the age of this rock shaped by human hands. The most recent object is a credit card (expired)! Exquisite statues from around the world. The above image is a composite from 4 separate pages of sketches. 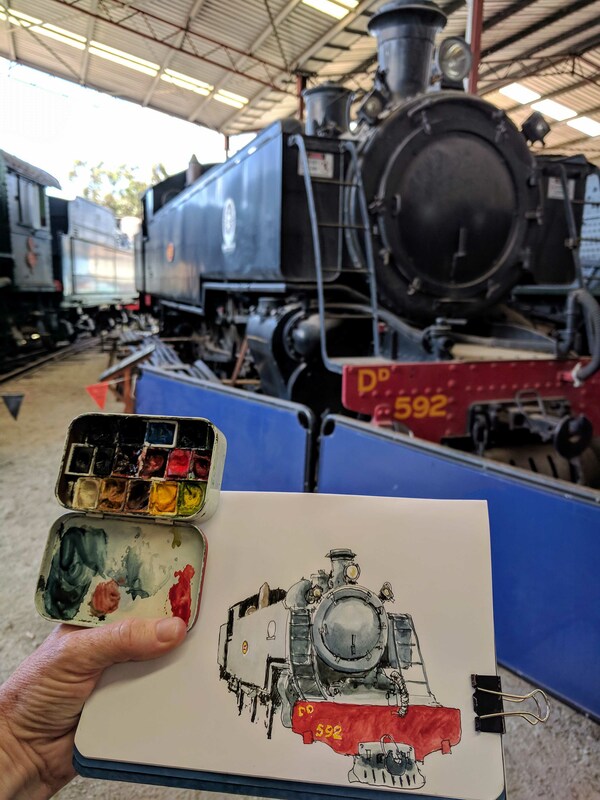 A quick sketching catch up at the Aviation Heritage Museum in Bullsbrook this week. Two hangars packed with all sorts of flying machines from gliders made of bamboo, string and glue to a real Lancaster Bomber. There was so much to choose from in the museum it was hard to get pick on one thing to get started, I really like the graceful shape of this C47 DC3 Douglas as it towered overhead with the light shining in from one end of the hangar. This sketch was quite tricky….drew in pencil first the general shapes then ink and watercolour washes, about 1 hour. 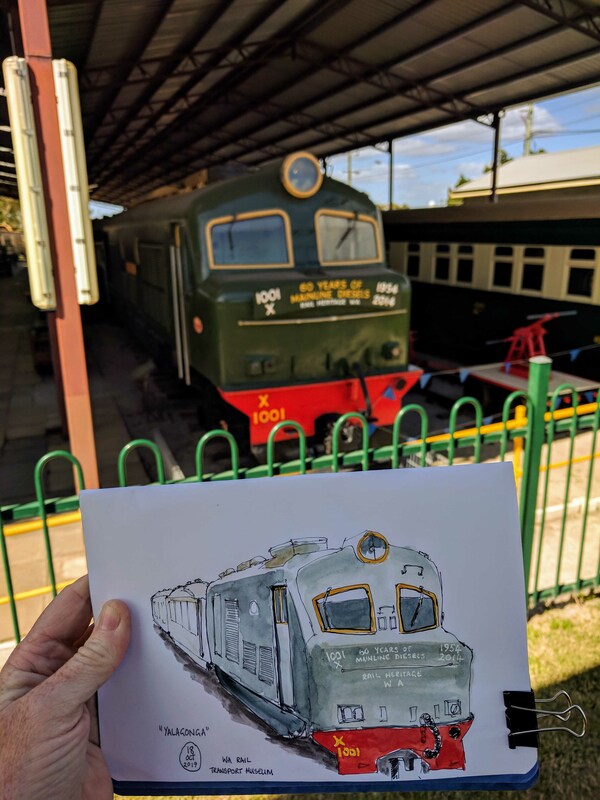 First ever meeting of the Perth Urban Sketchers today…yay…!!! 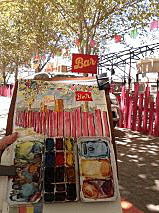 There were six of us today meeting in the city to sketch, chat and swap tips, lovely to meet like-minded sketchers. We gathered in front of the Perth Museum….there are some benches and shady trees (which was essential as it was rather a warm 35’C day). The Perth International Arts Festival is in full swing and the Fringe World Festival has lots of tents and acts gathered along the James Street Mall…there is colour just exploding around you! 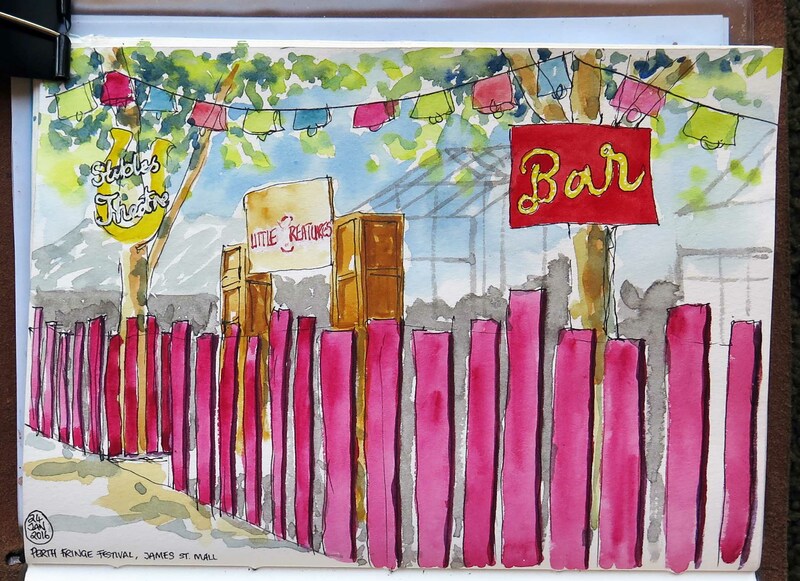 This scene with the shocking pink fence was unmissable….I took about an hour to sketch this…spent the other hour chatting! 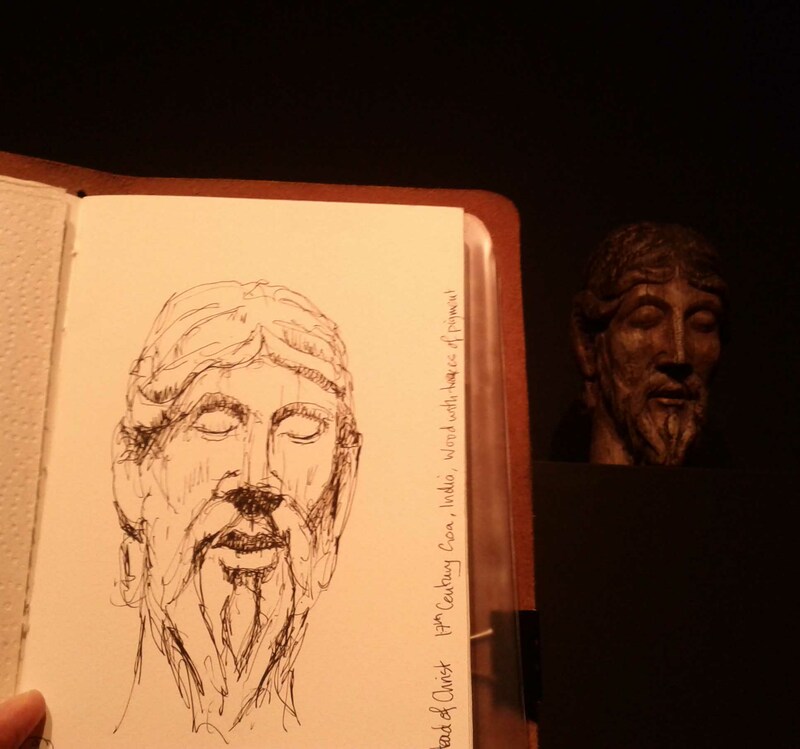 Everyone enjoyed, we all sketched different things…. 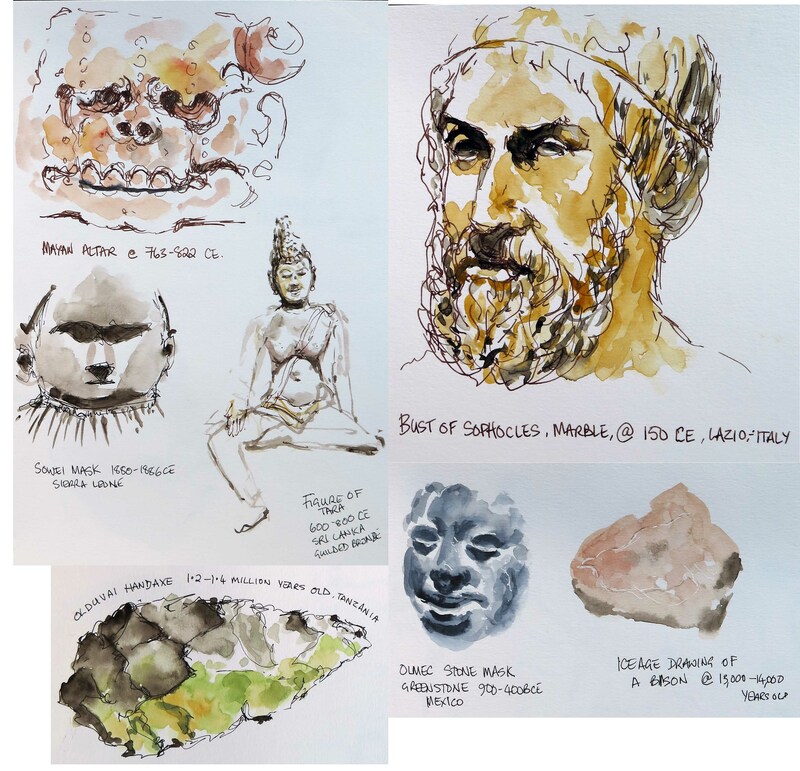 it was so wonderful to see what people chose to draw, each in their own style…. we plan to have more “sketch-outs” in the near future. 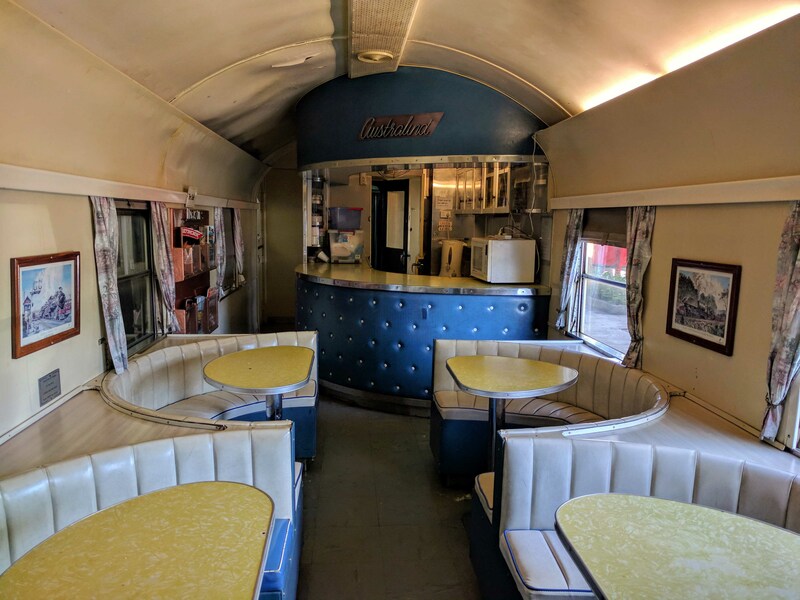 Link below to group photo…. 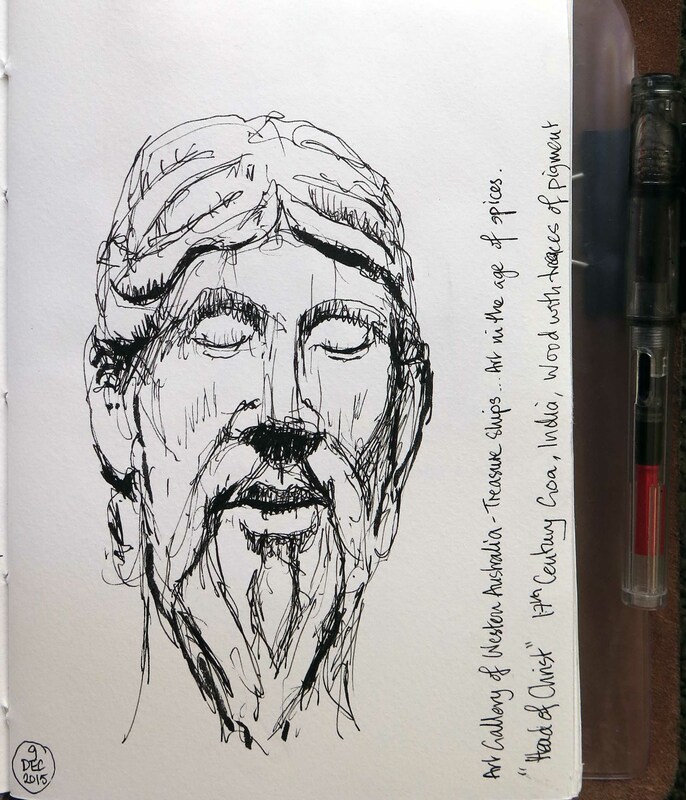 A fountain pen sketch of a 17th century statue – head of Christ carved from wood in Goa, India. I haven’t quite captured the serenity of the face (particularly the eyes) but I enjoyed the challenge. This is a really interesting exhibition at AGWA of statues, ceramics, textiles, paintings and miscellaneous objects that reflect the mingling of cultures and religions when the nations supplying and controlling the spice trade came into close contact for the first time. De Atramentis Document ink black in Lamy Safari EF fountain pen, standing holding homemade sketch book.